Swiss skier Lara Gut didn’t get off to a great start at the 2018 Winter Olympics, crashing into a crowd of photographers in her first run in the Ladies’ Giant Slalom event. Gut appeared to recover from the spill relatively unscathed, as did the photographers who suddenly found themselves in her wake. Thankfully, the Olympics are far from over for Gut, as she is expected to contend for medals in two other events. 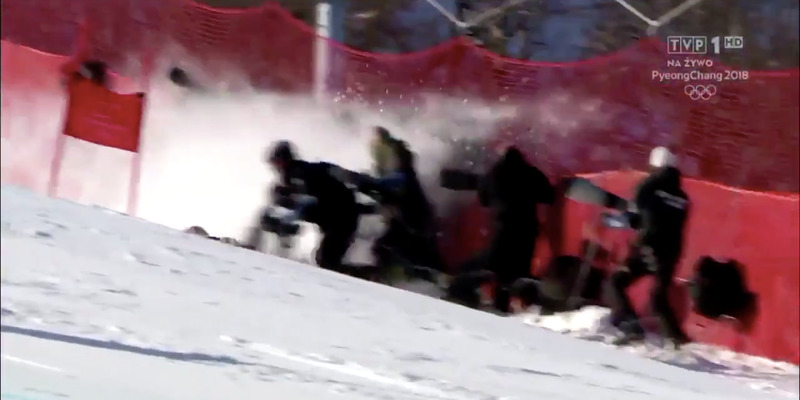 The 2018 Winter Olympics got off to a rough start for Swiss skier Lara Gut. After multiple weather delays pushed back the start of numerous alpine skiing events for days, Gut was finally ready to start taking on the mountain on Wednesday night competing in the Ladies’ Giant Slalom. Unfortunately for Gut, her run was over just a few seconds after it began, as she skidded out on a turn and crashed into a crowd of photographers lining the side of the course. Gut didn’t seem to frazzled by the fall, getting up with relative ease and riding down the mountain to awaiting medical staff. It appeared that most of the photographers were able to get upright soon after as well. While it was far from an ideal Olympic start for Gut, her Winter Games are far from over, as she is expected to compete for a medal in both the Super-G and downhill events in the coming days.